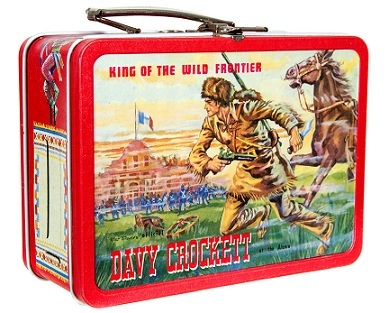 Tin Lunch Boxes HQ: Great Nostalgic & Retro Designed Metal Lunch Boxes! – The Best Selling Lunch Box Of All Time! 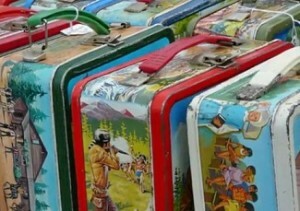 – The Largest Lunch Box Collection In The US? Please enjoy your stay and let me know if you have any comments or questions! This 6abc news item features some interviews with random people on the street reminiscing about their childhood lunchbox experiences and also mentions the Leave It To Beaver special edition box. Actionrep is a true enthusiast and in this 4 minute video he gives a nice tour of part of his collection featuring boxes from the 1980s. This period was of course the decade of the personal computer and you can see boxes from the Pacman & Dragon’s lair video games in this video. 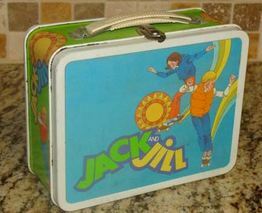 Check out his channel here for more discussion about 1960s and 1970s lunch boxes. We are big fans of his videos! A very short video this one, 54 seconds on the mass merchandising of Beatles memorabilia during the mid-60s. Finally, here is a slightly crazy but fantastic video from stand up comic Louise Palanker who gives a little tour around her home including her fabulous lunch box collection. Flipper, Bee Gee’s, Gunsmoke, Happy Days & Little House On The Prairie are all featured here. With the lunch box bonanza gathering pace in the early 1950s there were several new entrants into the market, all keen to a turn profit from the apparent explosion in these fashionable items. ADCO was one such player who began making metal lunch boxes in 1954. ADCO-Liberty MFG. 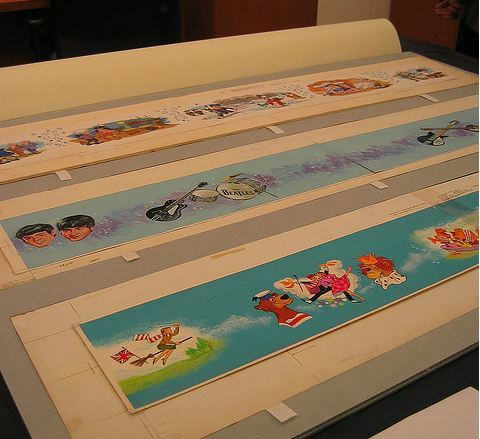 Corp., to give the company’s full name, featured several designs including E. Roger Muir’s, popular NBC Howdy Doody TV show and also some successful Disney models including Donald Duck, Mickey Mouse and Davy Crockett. However, it was the company’s relationship with Disney which would eventually put an end to its lunchbox production. Just two short years after ADCO-Liberty began manufacturing operations, a dispute with Disney occurred over the Davy Crockett, King of the Wild Frontier model. 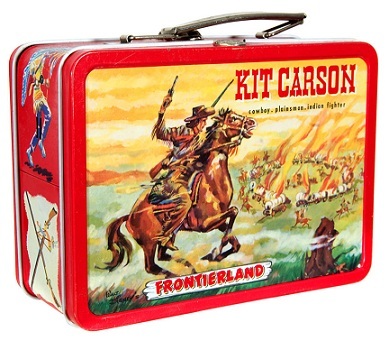 Whilst Davy himself was a licensed character from the 1955 Disney film, in an effort to increase the marketing appeal of the lunch box, ADCO had decided to feature Kit Carson on the rear of the product. Kit, of course, was a non-Disney TV hero and this caused disagreement between the two companies. The exact details of what went on are unclear, but the end result was, in 1956, that Disney switched over to Nashville-based Aladdin Industries for lunch box design and manufacture. Simultaneously, ADCO shut down its operations in Newark, New Jersey. There are some rare and valuable ADCO collector’s items. The pictures below are of the product that caused the Disney dispute. Including the 15% buyer’s premium, it sold for $347.88 on 27 May 2010 at Hake’s Americana & Collectibles. Kit on the Back - Oops! 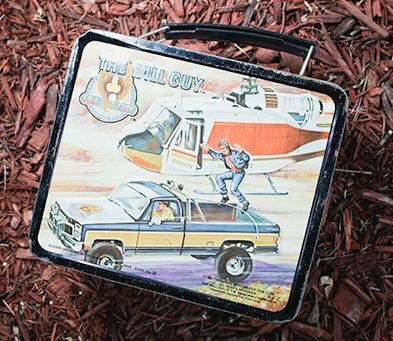 As we’ve mentioned previously on this blog, people who are searching the internet for “metal lunch boxes” – or similar and related phrases – are usually interested in either buying a lunchbox for day-to-day use, or, are collectors looking for information on auctions or prices. With this in mind it is interesting to delve a little deeper into the trends and demographics of these online searchers. How do we do that, I hear you ask? Answer: Google Insights! Google Insights is a free and fascinating little tool which tells you all about how many people are searching for a given phrase and how the trend changes through time. Finally, it allows you to see where people are making those searches, e.g., in North America, Australia, Europe, etc. So for a little bit of fun, let’s take a look at some of the more common phrases that people would search for in our area of interest. Now, all very interesting you might say, but what does this prove? Well firstly we can see that the long term trend is fairly stable through time. However, what is very apparent are the spikes which seem to occur in the second half of each year. This of course confirms what many of us lunch box enthusiasts know already, which is that interest peaks during the back to school period that runs approximately from late July to early September. If this data is correct – and we’ve no real reason not to believe it – then it shows that web searches on this phrase peak in August every year and are in fact more than double the level of the rest of the year! For collectors, this is very important as many of them have said that they see auction prices for vintage pieces increase in the weeks during and after this period. We can see that this new term shows the same seasonal pattern but has a greater number of total searches. Obviously, the good folks in the United Kingdom also have a passing interest too! It would be great to delve further into this and look at trends for individual designs like “Mickey Mouse lunchbox” or “Hello Kitty Lunch Box”, but unfortunately the Insights tool tells you that there is not enough data! After publishing the two recent articles on tuned.. However, in the process of my research I came across this lunch box quiz which is a lot of fun and actually has some really good questions. I definitely learnt a lot, but I’m too shy to tell you my score! By the way, if you are enjoying the articles on Tin Lunch Boxes HQ then please subscribe to my RSS feed by hitting the button at the top right of the page. Alongside American Thermos and the fantastic Aladdin Industries, the Ohio Art Company became known as one of the “big three” lunch boxes manufacturers during the 1950s. 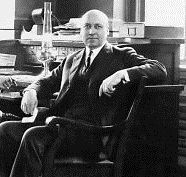 The roots of the company were formed by Henry S. Winzeler, a dentist and art enthusiast from Archbold, Ohio in 1908. In the early days it was mainly picture frames and other novelty items that rolled off the production line. Gradually, as printing and lithograph technology evolved towards the end of the First World War, Henry moved into the toy business adding in windmills, drums, tea sets and of course the famous “climbing monkey”. Ohio’s success continued during the interwar period and a year after incorporating in 1930, they paid a $6 dividend to shareholders. Steel restrictions from 1942 to the end of WWII shut down the company’s toy manufacturing processes which were converted – albeit temporarily – to produce technical parts for the military. By the 1950s, the metal lunch box craze was in full swing and Ohio, who had a background in lunch pails (the precursor of “modern” metal lunch boxes), played a significant part in it. Business was healthy and the profits from this period enabled Henry to pick up on an idea developed by French inventor and electrician Andre Cassagnes which later evolved into the all-time classic children’s toy, the Etch-A-Sketch system. Today, Ohio Art has two main business divisions. The first is still centered around Etch-A-Sketch plus other popular toys, and the second remains focused on the metal lithography technology which propelled the mass lunchbox popularity of the 1950s. If you type the phrase “metal lunch boxes” into Google or a similar search engine then you are probably looking for one of two things: Either you are interested in collectible lunch boxes or you just wish to purchase a product for everyday use. Of course, purchasing a box is very straightforward. There are a ton of specialist retailers that you can find online as well as more generic sites such as Amazon and eBay which have many items listed. 1. Check the Vintage & Cross Check the Price. Prices on online auction sites can be a little baffling sometimes. Often the seller has discovered a long lost lunchbox in his or her attic or garage and has decided to sell to raise some extra cash. In these cases list prices may be inappropriate and although this means that they are often too high it is sometimes the case that the seller has not realised the true value of the piece they are selling! For this reason rule #1 is to always cross check prices! For example, if the box is listed on eBay then try checking on Amazon and vice versa. If in real doubt then consider consulting a price guide. 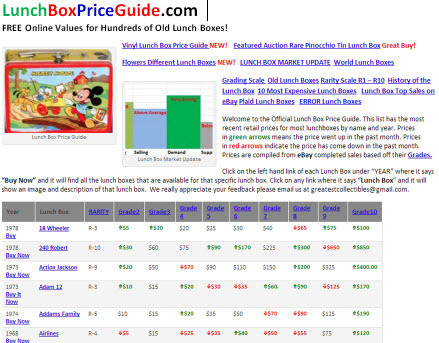 The prices of vintage metal lunch boxes can fluctuate throughout the year. The time at which prices are most likely to be inflated is during the Summer Back-to-School period. This is of course when parents are busy equipping their children with all the kit they will need for the new school term and this of course includes lunch boxes! I would speculate that this process invokes a certain degree of nostalgia in many parents who then proceed to go hunting for vintage pieces on the net! Many of the classic vintage pieces from the 1950s and 1960s proved so popular that they are still manufactured today. The giveaway is obviously if you find more modern vinyl or PVC boxes but sometimes replicate metal lunch boxes are still made. Some examples, include Disney School Bus, Hopalong Cassidy and the Roy Rogers metal lunch boxes. In terms of the latter a total of 7 version were produced in the years to 1957. So if you were interested in buying one of these then take some extra time to make sure of the exact year. Good luck, and please don’t forget to leave your thoughts in the comments section below!